"An easy to make, nutty version of this vegetable." Heat the oil in a medium saucepan over medium heat, and saute the onion until tender. 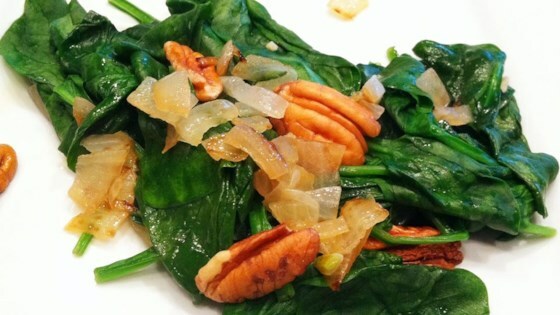 Stir in the spinach and water, and cook until wilted. Mix in the pecans, and continue to cook and stir until warm. Watch how to make this top-rated Spanish recipe. We loved this recipe! I omitted the onions and substituted whole garlic cloves like Carraba's does (I think I spelled that right). Look out Popeye! This was very quick and easy. My husband was hoping it would have a stronger pecan flavor. Really tasty! Definitely add more spinach. They wilt and come down to almost nothing. I used almost a whole bag, less water and more pecans.